In addition, the client is kept fully abreast of the prosecution by a report letter upon the filing of the patent application, the granting of a filing date and the receipt of the first Office Action. In the United States an inventor may file a provisional patent application. This is an application that requires no claims and is never formally examined. The inventor then has one year in which to file a non-provisional application. The non-provisional application is the document that is actually examined. The provisional application can be used, for example, to acquire an early filing date for the application and the intervening year used to determine the commercial viability of the invention. The cost of preparing a non-provisional patent application varies depending upon the complexity of the invention and the amount of detail provided in the invention disclosure. The more and better detail provided, the easier it is for the attorney to grasp the ‘point of novelty’ of the invention, describe the invention in the specification and draft claims accordingly. The filing fee for a provisional application is less than that of a non-provisional application. Also, because there are no claims required in a provisional application, it can be drafted and filed for less than a non-provisional application. We can quote a fee for preparing a patent application only after reviewing the invention disclosure and determining its sufficiency, as well as the technical and scientific complexity involved. The materials on this web site are provided for informational purposes only. They do not constitute legal advice. This web site is not intended to create an attorney-client relationship between you and The Law Office of George J. Lyman LLC. You should not act or rely upon any information in this site without first seeking the advice of an attorney. No attorney-client relationship is created without an express agreement between you and The Law Office of George J. Lyman LLC. 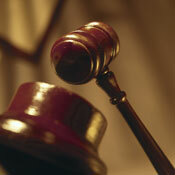 Copyright ©2007-2012 The Law Office of George J. Lyman, LLC. All rights reserved.